Flexion distraction is a chiropractic technique used to treat many conditions of the lumbar spine. It is a non-surgical technique aimed at increasing spinal motion and resolving disc bulges and disc herniation. The treatment is excellent as a safe, gentle, non-force procedure and works well to take pressure off the spinal nerves that may be injured or dysfunctional. Flexion Distraction involves using a special table that distracts and flexes the spine in an automated and gentle rhythmic motion. 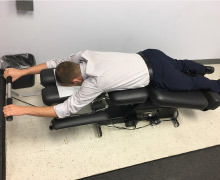 The Chiropractic Doctor will use some manual techniques with the table to resolve a disc herniation or bulge. The goal is to allow the spine to move correctly in a manner that will remove pressure from the disc bulge. It does this by creating a negative pressure that pulls the disc bulge back into the spine. The flexion distraction motion also maintains healthy disc through imbibition. The motion allows nutrients into the spinal disc and keeps them well articulated.